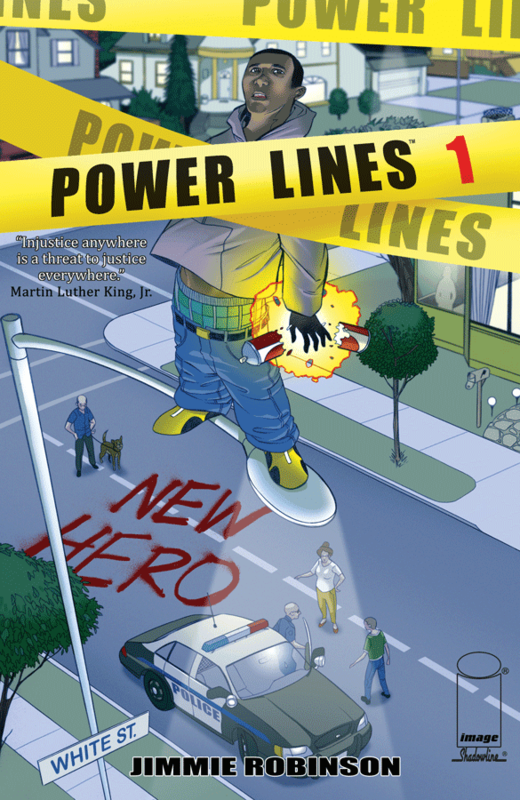 The Fellowship was fortunate enough to obtain a copy of POWER LINES #1 from Image Comics (via Shadowline Comics). Jimmie Robinson writes, draws, colors, and letters. D-Trick has gotten in with a crew, and they’re heading across the bay to the nice neighborhoods for a little tagging. D gets spotted pretty quick, and when chased down an alley he discovers that he can apparently fly – you know, like superhero stuff. Meanwhile, one of the crew has stolen Sarah’s purse, and she and her son track the phone to get it back. During the “meeting” Sarah has a similar discovery. There are a couple of complications in this story, not the least of which is that D is a black teenager and Sarah is a middle-aged racist. And those complications are what makes it so compelling – how can such diverse characters get over it and work together? Robinson covers all of the major tasks in this book, and his style fits it all together seamlessly to tell a story that I think will really mean something. This is a story with a ton of potential to take the reader to some really uncomfortable, yet really rewarding places. This is certainly one to check out. 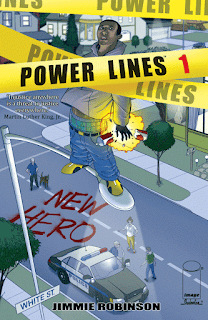 POWER LINES #1 is available now at your FLCS or at imagecomics.com.